LAST MINUTE SPECIALS – Winter Season ONLY : Book 14 days before and get 25% off – 7 days before arrival and get 30% OFF – Book 3 days before arrival and get 50% OFF! Minimum 5 night bookings. 1-800-256-4559 or 1-604-932-1966 Visit whistlersbest.com for current specials! LOCATION, LOCATION, LOCATION! 35% Return Guest Ratio! The single BEST location in ALL Whistler Village â less than 25 yds to the lifts of BOTH Whistler & Blackcomb and also RIGHT at all the best restaurants, bars & shops. No need for a vehicle. It DOES NOT GET CLOSER OR BETTER ! Private Deck facing slopes, best viewing for Events, Shows and All Mtn base activities! As local Whistler Residents we are happy to arrange for all your needs including: Transportation to/from resort / Pre-arrival grocery stocking / Restaurant bookings / Spa Services / Snow School bookings / Adventure outings / Child Care / Snow clothing rentals â¦â¦etc etc. We look forward to sharing our knowledge and information with our guests to make their Whistler experience more complete. Our Guest Testimonials speak about the Whistler’s BEST true ski- in/out experience. Thanks to the wonderful accommodation our family’s vacation was flawless. Your attention to detail seemed endless. I hope we have left the unit in satisfactory condition, as we look forward to coming back this summer. Cheers for having the mint condo RIGHT next to the Bike Park. Had a wicked time with the bikes,& loved the locals, ….especially the good looking one’s – Doesn’t get better !! Enjoyed the EXCELLENT LOCATION & the condo was well equipped – everything we needed to feel right at home. Much appreciated & thanks for all your help. You are the man. I am going to put this place on Traveladvisor.com & give you VERY HIGH MARKS ! …..worst days of our lives – EVER !! (not). Secret on Sunday night – go downstairs & hang at the Longhorn. Derek, W Hotel – Seattle Wa. Thank You for everything…..laughter / your stories / ski lessons & guiding / encouragement & even the GREAT food in Whistler & the Cougars at Buffalo Bills …..It’s ALL ’cause of you !!!!! What a beautiful spot ! – loved the accommodations. They were perfect for us. This was probably the best family vacation EVER. Hope to come back every year. The Bodes, Los Gatos, Calif.
Life is good on Whistler Mountain. What a GREAT place for people watching. This condo is made for our get-away weekend. I’m sure you’ll see us again. Alan Lande, who traded the type-A bustle of the Montreal fashion business for a laid-back lifestyle of snowboarding, skiing, and golf, rents some of the best ski- in/ski-out condos and town homes through his company www.Whistlersbest.com Accommodations. (On a snowy day, there’s nothing better than being able to throw your ski clothes in the dryer for a few minutes between runs!) Lande insists that since he is an owner operator and doesn’t have to include the usual 40% mark-up to cover management fees, his prices are below market value. Lande and his wife, Eileen, both of whom have impeccable taste and are incredibly discriminating, have made sure that every condominium they rent is outfitted with all the amenities they would want at home. This includes down comforters and pillows, expensive linens, fully equipped kitchens (cappuccino machines, blenders, etc. ), washers and dryers and Jacuzzi tubs or hot tubs. The best thing about renting from Lande is that you’ll probably get to meet him. Besides being charming and lots of fun, he is a true Whistler insider ready to share his wealth of information regarding favorite restaurants, preferred extreme skiing spots or the best places to shop. 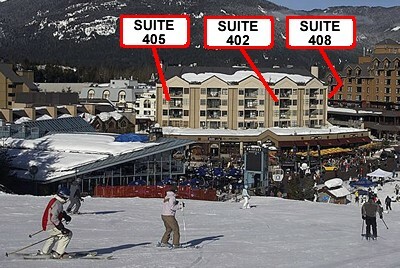 One of his properties, an extremely large two-bedroom, two bath condo with wood-burning fireplace in the Carleton Lodge ($450/night CDN), is located literally at the point where both the Whistler and Blackcomb gondolas depart. We had a great week! The accommodations were fantastic and very comfortable. See you for golf this summer. You’re ‘da best!! This place is GREAT, can’t beat the location. Skiing was fantastic – night life rocked ! ! We’ll definitely be back someday. Thanks again.